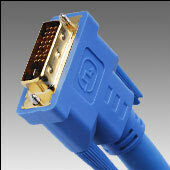 Dual Link DVI Cables: Copper based DVI-DL cables are available in lengths 3, 6, 10, 15 and 30 feet. These cables are HDCP compliant. NOTE: Dual Link displays require a DVI DL Booster for extensions over 15 feet.